On Thursday, July 26, the School of Dentistry gathered to celebrate the accomplishment of students participating in the 2018 Admissions Enhancement Program (AEP). The AEP is an intense, ten-week summer program designed to support prospective DDS students as they get ready to apply to dental school. The program helps students study for the Dental Admissions Test through eight weeks of online modules led by UMKC faculty, incorporating supplemental instruction, practice DAT tests, and access to the online CE Webinar. In addition, students spend two weeks onsite where they learn valuable study and test-taking skills, receive personal statement feedback, practice interviewing with faculty, engage with panels of dental professionals, and participate in hands-on learning experiences in the clinic and pre-clinical lab. 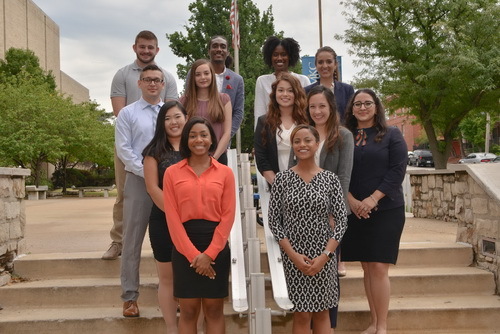 The AEP is committed to partnering with students from underrepresented, rural, and disadvantaged backgrounds who are motivated to attend dental school. This year’s AEP group consisted of twelve students from nine states including Georgia, Kansas, Maryland, Missouri, New Jersey, New Mexico, Oklahoma, Tennessee, and Texas. The UMKC School of Dentistry wishes the 2018 AEP students the best of luck as they take their DAT and apply for dental school!